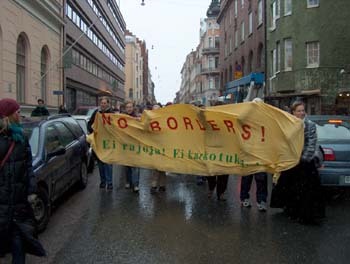 26.Mar.04 - On thursday 25th of March, noborder activists in Helsinki arranged a demonstration against the deportations of Roma. Appr. 100 people took part in the demonstration regardless of the rainy weather. The demonstration took place the same day the first Romani Slovaks were deported from Finland. Over 250 Roma from Slovakia have applied for an asylum in Finland this year, none of them has gotten a positive decision. In the media Roma have been labeled as "asylum tourists". The protesters demanded that no Roma should be deported to a country where police brutality towards Roma is reality. Furthermore, every human being has the right to flee from poverty, discrimination and institutional violence. Protesters paid a visit to Slovak Embassy and the Ministry of Interior, to condemn both the racist policies of the Slovak government and the decisions made by the Finnish Directorate of Immigration. Protesters also visited inside the office of Czech Airlines, which is making the deportation flights from Finland to Slovakia. The employees of the company were told that as they are responsible of the deportations as well as the Finnish authorities, they won't be given peace until they quit making deportations. Approximately 250 Romani Slovaks have arrived to Finland during the year 2004. The Directorate of Immigration (UVI) has processed the asylum applications quickly and negative decisions have been made like standardized products. The deportation of Roma has been planned to be started already on week number 13. We demand that no Roma should be deported to a country where police brutality towards Roma is reality. Roma have the right to flee from poverty, discrimination and the violence perpetrated by the Slovak State. Recently there have been riots in Slovakia caused by the decision of Slovak government to cut down social welfare dramatically. The government has responded to riots by mobilising thousands of police officers and soldiers to handle the situation - this is the biggest police mobilisation since 1989. The riots clearly indicate that the Slovak government has failed in its policies. Official data indicates that approximately 87.5% of the Slovak Romani population was unemployed during the period, as compared with an unemployment rate of 14.2% for the population as a whole. Discrimination on the labour market is widespread if not total, and in the recent past, public labour offices have accepted announcements from employers explicitly stating that Roma will not be considered. Due to this, Roma are affected very harshly by the cutdowns in social welfare. The schooling of Romani children in Slovakia has revealed extreme levels of racial segregation: in some Slovak schools for the mentally disabled, every single pupil was Romani. Discrimination prevails also in the health care system and some Romani women have in recent years been coercively sterilized. Many Roma live in extremely substandard, ethnically segregated slum settlements, which are lacking in formal infrastructure such as paved roads, electricity, heating, sewage removal and the provision of adequate drinking water. Roma have been evicted away from city centres. In 2001, the Slovak government amended the Slovak civil code to weaken the rights of tenants. In the wake of the amendments, there has been a significant rise in the number of forced evictions of Roma in Slovakia. Today, the Slovak state is still ready to punish Romani population and to ignore racism, discrimination and violations of human rights. The group of 43 Roma who arrived Finland on 18th of March are from Trebisov, a city in Eastern Slovakia, where hundreds of Roma have clashed with the police. In Trebisov dozens of Roma have been arrested, both men and women and even children. Recently appr. 240 police officers raided the local Romani community for a period of not less than 12 hours, during which officers violently entered the houses of Roma, without showing any form of authorization, struck with truncheons and kicked a large number of Romani individuals, in houses, in the open in the settlement, as well as in police custody, and subjected them also to electric shocks from cattle prods. According to a Slovak newspaper, one Romani man has been killed. Due to this, the Slovak government has announced that they will spend appr. 1 250 000 Euro on an image campaign to improve Slovakia's reputation abroad. The recent incidents indicate that the Slovak state cannot guarantee the human rights of Romani population, and because of this we demand that the plans to deport Roma from Finland must be ceased immediately. The deportation of Roma back to Slovakia would mean that Finland does not recognise the violations of human rights perpetrated towards Roma, but, in breach of all human rights agreements and western conceptions of human rights, accepts the oppression of Romani population.